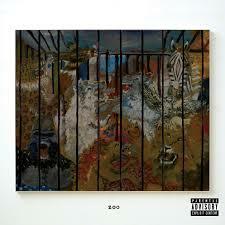 The outspoken and confident Russ Vitale’s latest project “Zoo,” released last month, is absolutely his best to date. This is Vitale’s 12th album in total, adding to his large discography of over 300 songs. The self-made rapper, singer, writer and producer holds nothing back with “Zoo,” from the beginning with “The Flute Song” being the first released single and first track of his 14-song album. The infamous artist is known for his stance on drug culture; he views many rappers as people who glorify drug and alcohol usage to their young fans and he doesn’t condone it. He is open about holding other rappers accountable for parading their drug usage in their music. It has become a trend, on Twitter specifically, to hate on Vitale due to him pushing back on the rap industry and refusing to be what other rappers expect of him. For example, he’s feuded with producer Metro Boomin’ earlier this year over Vitale’s belief that producers today aren’t making quality music. Vitale has also gotten into feuds with Adam Grandmaison, also known as Adam22 on social media and Rapper Smokepurpp over their bullying and poking at him on the internet. Vitale is also someone who doesn’t shy away from defending himself on Twitter from trolls and people who hate on him. One of Vitale’s major messages in “Zoo” is that he’s not to be played with in the rap game, and in general. He uses “Zoo” to all out a variety of people including online bloggers, journalists and other rappers. Vitale boldly calls out the glorification of drug usage in rap culture and the lack of real artistry today in the genre. He uses these songs to connect with his fans and remind people that he’s still a human with everyday problems, as well as new issues brought on by fame. In “Voicemail” Vitale pleads with God to answer his prayers and to speak to him personally. In this song he discusses his strained family life spanning from his parents’ divorce, his father’s struggles with mental health and the death of his grandfather. “[I’ll just] deal with what I’m dealt, well boohoo right? I shouldn’t care ‘cause I got houses and some new coupes right? … Arenas ain’t as loud as inner turmoil,” he says. On this track Vitale challenges the notion that he doesn’t have problems due to his fame and having money. “Parkstone Drive” dives deeper into the problems surrounding Vitale’s family and how his fame and becoming the main financial provider for his family caused a wedge between Vitale and his father. “Yeah, my parents’ marriage in shambles, I won’t lie, it hurts. I thought money would fix it, but it just made it get worse. … The family stopped turning to him [his father] and started turning to me. Going through it, I know he tried to hide the pain,” Vitale reveals. Relationship woes and drama are a recurring theme for Vitale and his music. In his songs “Missin You Crazy” and “Keep It Pushin,” featuring the singer Mahalia, he revisits past relationships and heartbreak. “Zoo” is an amazing story from start to finish and a look into the real Russ Vitale without the distraction of the internet hate that he’s infamous for. Listeners can expect the same stellar lyrics, beats, and singing from Vitale with even more of the confidence and rawness he crafts into every project he puts out. “Zoo” has a song for every fan’s taste and mood and he stays true to himself and his artistry throughout the project. Be the first to comment on "“Zoo” shows up and shows out"